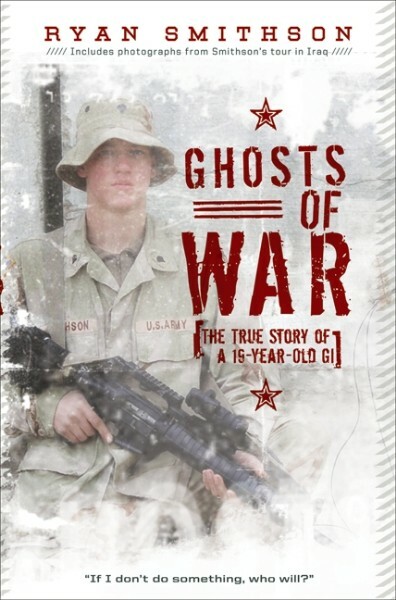 Ghosts of War: The True Story of a 19-Year-Old G.I. Ryan Smithson, like most teenagers, was unsure of where life would lead after high school. Inspired by the patriotism following 9/11, he joined the army reserves and was deployed to Iraq in 2004. Returning home to a new bride and a college campus, he began writing about his combat experiences. What began as an essay for an English class turned into much more when Ryan compiled his writings into his memoir, Ghosts of War: The True Story of a 19-Year-Old GI (Collins). He has since traveled the country to talk at colleges, high schools, libraries, and education conferences about his experience in the Iraq War, and continues to benefit from the therapeutic aspects of writing and storytelling. As he describes enlisting in the Army in the wake of 9/11 at the age of 17, undergoing the disciplinary harshness of basic training, and living through the fire of combat at just 19 years of age, Smithson brings his audiences into the life of a teenaged Army private serving his country half a world away. When Smithson returned home to his wife, he went to college for a degree in criminal justice, and then for cultural studies and literature. He lives in Schenectady, New York, with his wife and family. "[Smithson's] poignant, often harrowing account, especially vivid in sensory details, chronicles his experiences in basic training and in Iraq. 'Only after we have been completely destroyed can we begin to find ourselves,' Smithson writes of basic training, offering an unflinchingly honest portrait of the physical and psychological brutality of that experience. His account of his tour of duty in Iraq is no less compelling. He lucidly recounts the intensity of battle and the pain of losing comrades. For Smithson, the war is a source of personal enlightenment, and this memoir is a remarkable, deeply penetrating read that will compel teens to reflect on their own thoughts about duty, patriotism and sacrifice." "Smithson avoids writing either prowar propaganda or an antimilitary polemic, providing instead a fascinating, often humorous -- and occasionally devastating -- account of the motivations and life of a contemporary soldier." 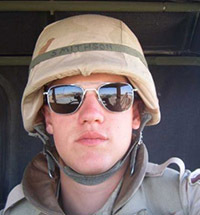 "Smithson experienced the events of 9/11 while in high school and responded by enlisting in the Army Reserve after graduation. He married his high school sweetheart before being deployed to Iraq...Some of the author's most poignant passages are his descriptions of interactions with Iraqi children. Where he was expecting rock-throwing, he encountered barefoot, dirty children grateful for the water the soldiers gave them. It is these children and the villagers he met that help explain for him the purpose of the war. The book ends with Smithson's return home, his almost magical escape from night terrors, and his work with children in his own hometown. Writing proves to be his therapy for PTSD."